Cody Pletz teaches children about plenty of sports through his job with Coach Dave Gray Sports. One of his own favorite sports, bicycling, stands out. That idea is driving the Allegheny County Parks Department’s new introductory mountain biking class for children, which began late last month. 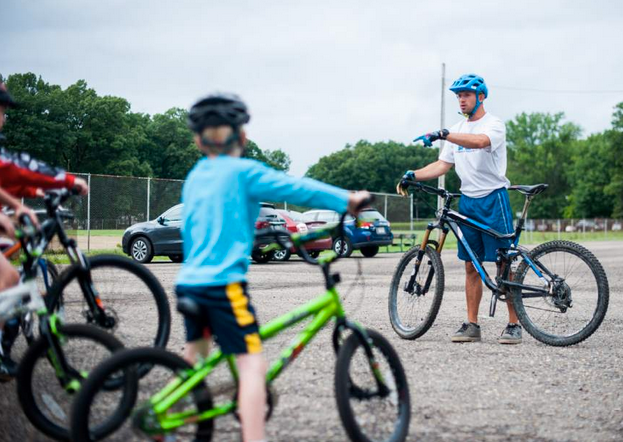 Over the course of eight sessions, Pletz is teaching children ages 7 to 12 the basics of mountain biking, including safety. By the final class July 22, Pletz hopes the students will be able to navigate a full trail. “The idea is to get kids engaged in the sport, teach them how to do it safely, teach them everything from the basics of mountain biking safety, what to do if they get a flat tire, how to do trail maintenance (and) all those kinds of basics,” Allegheny County spokesman Kevin Evanto said. Traditionally one of the most popular sports for children, biking took a hit in overall participation in recent years. According to the Outdoor Foundation’s 2014 Outdoor Participation Report, 13.6 million Americans ages 6 to 17 participated in road, mountain or BMX biking in 2013. That was a jump from 13.4 million participants in the previous year’s report, but still fell far short of the 14.7 million listed as recently as 2010. Biking still rates as the top sport for participation, with 27 percent of Americans ages 6 to 17 taking part. The report doesn’t distinguish among BMX, road or mountain biking. Pletz said mountain biking lags locally compared to other areas where he has lived, mainly because of Western Pennsylvania’s topography. “Narrow, winding streets and a lot of hills don’t lead parents to feel very secure about their kids riding,” Pletz said. Before children learn how to mountain bike, it’s important that they know the basics of operating a bicycle. Potoczny and Pletz suggested children would be better off learning mountain biking from a trained instructor, rather than a parent or friend. Both the Wheel Mill and CDG Sports offer instruction. When on a trail for the first time, Potoczny advised that kids go slowly. Pletz said it’s also important not to travel alone. If safety guidelines are followed, Potoczny said, children might be able to develop a long-term interest in biking.